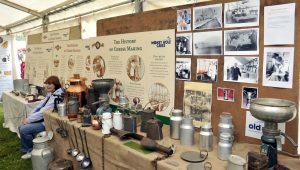 The heritage tent looks set for a bumper year at this year’s show with a great mix of local, country, rural and cider history. So far displays have been booked from organisations as diverse as North Somerset Yeomanry, the Somerset Archeology and Natural History Society, U3A Shepton Mallet and Somerset Rural Life Museum whilst Yeovil and District Metal Detectorists make a very welcome return. The local history group will be showing the cycle of photographs they put together for the recent Queen’s 90th Birthday and there will be a number of other local displays. The marquee is also home to the Cider Championship which is one of the oldest still running and the only one really focused on the tradition of Somerset Farmhouse Cider. It is hoped that will be supplemented by some historic cider artefacts, a demonstration of cider making for those with apples to spare in their gardens from Vigo Presses as well as a display in tribute to the Shepton Cider Mill which isn the throes of shutting down. We would welcome more photographs of the Shepton Cider Mill and its products to help build this display. In addition there will be a display of old milk bottles, cider mugs for sale and the usual bookstall of local books at which Alan Stone will be on hand to sign copies of his new book ‘Finding Good Cider’. If anyone has anything else that they would like included in the tent please get in touch with us – the more the merrier. © 2016 - 2019 Mid-Somerset Agricultural Society. All rights reserved.